This article authored by Susan Sheppard is a follow-up to her previous interview conducted with Commander Smith of NGA to further examine the use of Harris FAME technology. 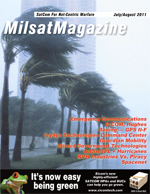 One of the greatest challenges facing the military, intelligence commu­nity and other federal agencies is that of efficiently acquiring, managing and distrib­uting satellite images in a multi-sensor envi­ronment. Massive volumes of intelligence information need to be processed for tactical analysis, surveillance, training, reporting and information-sharing missions. Adding to the challenge of volume is the fact that such data often arrive in multiple formats and from various intelligence, surveillance and recon­naissance satellites, sensors and networks. Satellite coverage accessibility enables communications in remote areas, further increasing the quantity of images and the speed at which they can be obtained and put to use  if the right tools are in place. Harris Corporation provides systems that move, store, and manage broad­cast video content from the time it is created to the time it is distributed  to the right place, at the right time, and in the right format. Today, Harris is applying its expertise in man­aging and distributing all types of rich media content to enable the Department of Defense and federal and intelligence agencies to benefit from the same commercial off-the-shelf solutions that have been proven in demanding commercial broadcast applications around the world. Specifically designed for intelligence applications by experts in the broadcasting field, FAME features an open platform to integrate third-party and custom applica­tions for use by military analysts. The Harris Full-Motion Video Asset Management Engine (FAME) system, developed with input from intelligence analysts, is a collaborative platform that provides video, audio and metadata coding, video analytics, and archive capabilities within a unified digital asset management solution. Simultaneous motion imagery feeds from multiple sensor types, satellites, and Unmanned Aerial Vehicles (UAVs) can be ingested, annotated, and shared in real time. Discovery and dissemination of motion imagery products within bandwidth-challenged networks are supported with a thin (remote) web-based client for at-distance access and collaboration. Successful exploitation of intelligence means providing battlefield commanders with real-time information that allows them to effectively respond to and neutralize enemy threats. Recently, the FAME system was demonstrated at Empire Challenge 2008 to prove how the military can use new technologies to capture motion imagery data from satellites, UAVs and sensors for situational awareness. Co-hosted by the U.S. Joint Forces Command and the National Geospatial-Intelligence Agency, the annual invitation-only exercise provides a platform for joint forces to test, evaluate and recommend situational aware­ness tools, including imagery and analysis tools for intelligence, surveillance and reconnaissance. These tools are designed to enable the integration of multiple dissimilar UAVs in a collaborative environment and are expected to provide high-resolution, highly accurate UAV intelligence, surveillance and reconnaissance imagery to tactical and operational-level warfighters, as well as exploitation cells. FAME also was one of a number of new technologies that was demonstrated and played a key role in the Motion Imagery (MI) Pilot Initiative at Empire Challenge 08. The objective of the Pilot was to address the efficiency and interoperability of the available platforms as a force multiplier, to improve MI efficiency, usefulness, and accessibility. The FAME systems primary mission was to add value to, and improve the discoverability of, motion imagery. FAME enabled analysts to select from among multiple, live Unmanned Aerial Systems (UAS) feeds or pre-recorded streams, and perform exploitation and dissemination in real time within a collaborative environment, continued Stone. Analysts could collaborate simultaneously to annotate the video with mission text chat, telestration and audio. Annotations were then saved as rich metadata time-associated with the video for later search and retrieval and publication to the DCGS (Distributed Common Ground System) Integration Backbone (DIB). FAME met all objectives of the pilot and demonstrated the benefits in leveraging commercial broadcast technologies for government tactical needs. The FAME systems hardware is composed of leading-edge broadcast components that support standard- and high-definition formats and Internet Protocol Television, and are used by major commer­cial broadcasters around the world. The FAME software enables the collection, automation and addition of metadata; provides a platform for the fusion of metadata from multiple intelligence (Multi-INT) sources; and automates workflow processes, regardless of content source. Multi-INT content can be tagged with many types of metadata, including temporal, geospatial, video analytics, voice annotation and fusion with other metadata sources. The FAME initiative directly addresses the usability issue, allowing forensic use of MI that has, up until now, been stockpiled and generally forgotten. Future iterations of FAME may include the re-broadcast of the enhanced video stream, allowing users to choose one or several of the attached metadata streams for display as a crawler (typically used on CNN at the bottom of the screen) or in an embedded window. FAME layers metadata streams into a corresponding video stream. The resulting enhanced video stream is then stored and can later be searched on by the new metadata content. Susan Sheppard is the principal consultant for Rochester, NY-based Certa Cito Marketing Communications, and specializes in marketing, communications and media relations. Ms. Sheppard has 25 years experience in defense, government, communications and technology markets, and holds masters and bachelor degrees in Communications and Journalism. She can be contacted at smsheppard@frontiernet.net. Harris is an international communications and information technology company serving government and commercial markets in more than 150 countries. Headquartered in Melbourne, Florida, the company has annual revenue of $5.4 billion and 16,000 employees  including nearly 7,000 engineers and scientists. Harris is dedicated to developing best-in-class assured communications®; products, systems, and services. Additional information about Harris Corporation is available at www.harris.com.